My impressions about the imminent loss of our petroleum way of life, what can be done to cope during the transition and what it means to recover from it. I now work at SFGH on the fourth floor. My unit specializes in Traumatic Brain Injury, ICU step-down and acute alcohol withdrawal. 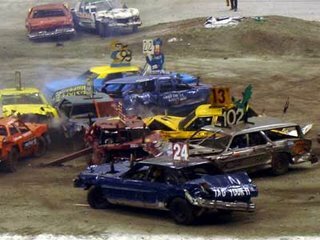 All I can say is that if the Nursing School learning curve was a Sunday drive in the park, the curve I am on now is a demolition derby. Several factors make this nursing very daunting: The sheer volume of documentation, the constant manual keeping up with ever changing Doctor’s orders; the clarification of said orders; the delivery of medications and procedures in a timely and accurate manner; the pressure to know what each of these meds do and whether or not the Doctor is wrong. All the while, since this is ICU step-down, knowing that my patient may head south and I may need to call a MERT (Medical Evaluation Response Team) or a CODE. In addition, because General hired me as a Per-Diem Nurse, I only get 14-days training and I am on day eleven. I have already challenged the logic of this with my manager and nurse educator however. Presently I am handling three patients with my preceptor (the maximum for my unit) and I am learning team nursing, where I work with an LVN who has three patients also. This means though that I am ultimately responsible for all six patients and for the delivery of IV medication to my LVN’s patients. I also need to sign off on all my LVN’s massive documentation. My brain is literally being rewired. I have the ‘overwhelm’ dreams typical of any new intense job; during my days off, my mind is constantly gravitating back to work. Don’t get me wrong, I am okay with this. At this point in my life, perhaps because I realize there are fewer days ahead than there are behind, I don’t care about the stress. I have absolutely no interest any longer in finding what will ultimately make me ‘fulfilled’. I don’t care if I have mean coworkers or bosses. I obsessed about this ad nauseum in the past and no longer have any patience for it. Miraculously, I have learned to completely ignore insults, slights, and even outright aggression. There is even time to crack an inappropriate joke now and then. I have found a good career; it will likely be my last, albeit with variation along the way. I will get through this learning curve. Four of the charge nurses on my unit are City College graduates who came to 4B between two and four years ago; they make it look easy. Eventually, so will I.
I am thinking of rededicating Gone to Croatoan to the notion of sustainable living. What with the slow unfolding of Peak Oil on our lives driving up the price of everything, and the simutaneous crash of the housing market nationally, it seems to me that a great deal of heartache could be prevented. Just shop less; turn off your TV's; drive less. "Sure, sure. Easy for you to say," you say. I think we are arriving at a point where you can either simplify voluntarily, on your own terms, or you will be forced to, through circumstance. "There are no answers, only choices."